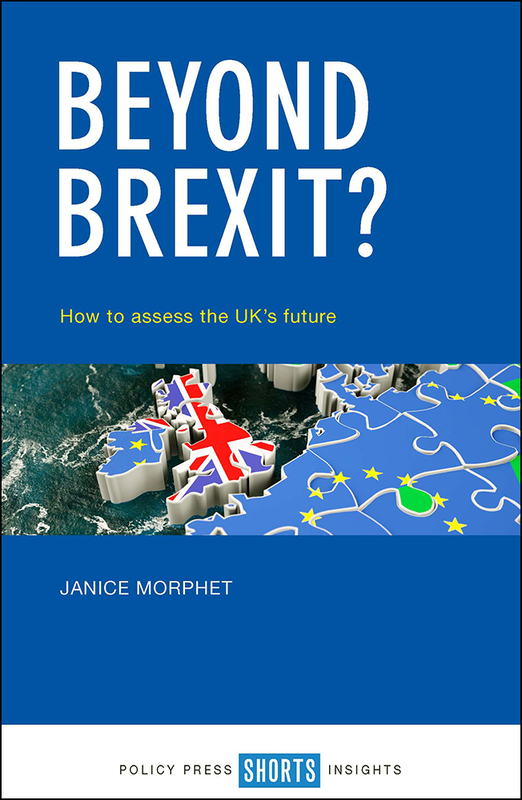 Following Theresa May’s survival of this week’s no confidence vote, Janice Morphet, author of Beyond Brexit?, reflects on May’s Brexit negotiating strategy over the last two and a half years. “In 2016, after the referendum and Cameron’s resignation, Theresa May ended the selection process for a new Prime Minister as the only candidate. She seemed ideal for the task ahead, having earned a reputation for quiet efficiency at the Home Office, a sometimes difficult department which had kept out of the news during her long period as Home Secretary. What was less clear was her approach to negotiations with the EU in the coming months. Over the period since, we have seen three distinct phases of these negotiations. In those first months, the Prime Minister took charge of shaping the negotiation agenda, with her political rather than civil service advisers. There were some issues of concern about the implications of Brexit for ‘just in time’ manufacturing and services, but these appeared to be bought off by Government assurances of no disturbance to the current methods of working, including an undisclosed letter to Nissan. In this ‘Brexit means Brexit’ period, there was not much outward sign of the PM’s negotiating strategy – shared with either Cabinet or Parliament. She chose rather to be guided by her political advisers Nick Timothy and Fiona Hill who moved from the Home Office to No. 10 when she changed jobs, whilst her ambassador in Brussels resigned after his advice was ignored. Timothy persuaded the PM to adopt a package of red lines that would lead to a very restricted future deal for the UK with the EU. Although it was clear that, under WTO rules, the EU could not negotiate a future trading relationship with the UK until after Brexit had been implemented, just as the UK could also not conclude any trade deals in its own right until that point, the Prime Minster was adamant that she wanted to have commitments to a future trading relationship as part of the process of the UK’s departure. The EU negotiator, Michel Barnier threw an olive branch to the UK, indicating that the preliminary discussions on the future UK EU relationship could commence once there had been sufficient progress on the Withdrawal Agreement. Once she had a plan for the negotiation, despite several denials, the PM called a general election in June 2017. What was promoted as a snap election was conducted over the same period as others. It resulted in the loss of her Parliamentary majority. She also lost her political advisers, Timothy and Hill and these were replaced by her new civil service advisor, Olly Robbins, who has subsequently undertaken the negotiation directly on the Prime Minister’s behalf. She also made a confidence and supply agreement with the DUP in order to provide her government with a working majority. The election marked the beginning of the middle passage of the Brexit negotiations for the PM. Coming quickly afterwards, the horror of the Grenfell Tower fire exposed the impact of austerity policies and deregulation which were the hallmark of the coalition government in which May served. This period extended to the Windrush scandal which demonstrated what the PM had been keeping quiet while she was managing the Home Office. Her obsession with migration over all other aspects of Brexit started to emerge in the third stage of Brexit, as her main sales strategy to the British people. This destroyed her reputation and, with Amber Rudd’s resignation, started the unwinding of the government. However, the middle passage also demonstrated another aspect of May’s negotiation style. Under pressure, she gives way, making agreements or commitments which she subsequently attempts to forget. In December 2017, the PM wanted to agree a position with the EU that substantial progress on the withdrawal agreement had been made so that she could proceed to discussions about future relationships. In all-night negotiations, she agreed the guarantee to maintain the commitments made to Northern Ireland in the Good Friday Agreement 1998, subsequently known as the backstop. This meant that there would be no borders on the island of Ireland and Northern Ireland remains in the Customs Union and Single Market. Those around the PM were told that this political agreement was not binding. David Davis echoed this view on the Marr programme on the following Sunday, only to be met by Barnier’s riposte that the backstop was binding and would now be included in the final agreement as the UK did not understand the political commitments it had made. So what about the third stage, where the previous promises the PM has made in the Brexit negotiations are coming back to haunt her? Many in her party have come to distrust her promises which appear to reflect the wishes of those she is speaking with, rather than any intention to keep them. Dominic Grieve found this when he was persuaded to withdraw from an opportunity to defeat the government only to have the promises made to him removed the following day. The humiliation of the Salzburg Council demonstrated her weak position to the UK and was a prelude to the final text of the Withdrawal Agreement as she gave way to pressure again and abandoned her commitments to members of her party and the DUP on the backstop. She also had to give way to Spain on future negotiations that affect Gibraltar. Her red lines have meant that much of what was promised has not been delivered and even the PM’s Chequers proposals, which caused more Government resignations, appear to be a better deal for the economy compared with what is available now. Her Political Declaration on future relationships between the UK and the EU is vague and not politically binding. There appears to be no Parliamentary support for a ‘no deal’ position and trading on WTO terms only would put the UK in the WTO’s division four, the lowest. There is still no trading relationship proposed for services – which comprise the largest part of the UK’s economy. Further, can Brexit be resolved until some of the other outstanding questions are answered? Who funded the DUP’s intervention in the referendum? Is there a relationship between Leave.EU, Banks and Russian money? If so, would this result in the referendum being declared void? What will emerge about Farage’s role in the Mueller investigations on the role of Russian influence in the US? Is the Government fettered by promises made in the 2015 Parliament about the referendum as any Parliament cannot fetter a future Parliament and we have had a general election since then? The People’s Vote has offered an opportunity to rally remain supporters but will it solve anything? What questions would be on the ballot paper and will 16 year olds and EU citizens be allowed to vote this time? While Norway+/EFTA provides a means of coming to terms with remaining in the EU, this retains the four freedoms including freedom of movement but no participation in the CAP, Fisheries policy or in decision making. The ECJ has determined that Article 50 can be with withdrawn until 29th March 2019 with no detriment to the UK’s opt-outs and rebates so what would trigger this course of action? Can the terms of the UK’s position in Brexit be changed? What will be the Conservative Party’s approach to maintaining power at all costs lead it to do both in the short term to avoid a general election and longer term to attract the millennial rather than grey vote? Brexit won’t be over until it is over – whether now or in the years to come. Beyond Brexit? by Janice Morphet is available with 20% discount on the Policy Press website. Order here for just £7.99.